Then I participated in an event conducted by the National League of American Pen Women, Palm Springs Branch, an organization composed of writers, artists, and musicians. For the project, each artist submitted a painting and each writer then chose one of the pieces of art to write about. 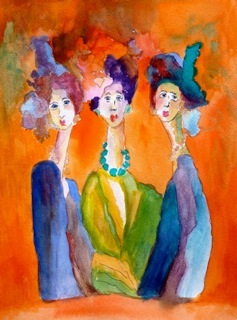 When I looked at this delightful watercolor by artist Lynn Centeno, and read its title “Girls’ Night Out”, I quickly found words to write. Not serious words, but playful ones … the girls surveying “the action” in an exclusive country club … the girls talking. Oh, my, can it really be? That’s dear Ingrid’s husband with a tart. said the girlfriend wearing her hat of orange. Carla’s divorce has set her free. Now she’s busy cougaring here. said the girlfriend under an aqua plume. said the girlfriend beneath a mauve chapeau. And savor an evening of delicious play. Wishing you a Happy New Year … time to dish … and happy writing! This entry was posted in Creativity, Finding Ideas: The Creative Process, Inspiration, Looking for Inspiration, poetry, Reading, Writing and tagged "dishing", artist Lynn Centeno, Ekphrasis, ekphrastic poetry, Girls Night Out, La Quinta, La Quinta Museum, Lynn Centeno, National League of American Pen Women, poetry, watercolor painting, writing about a piece of art. Bookmark the permalink. 4 Responses to Ekphrasis. Pardon me? What did you say? Susan – Glad you enjoyed. I really had fun writing this piece. I imagine Garrison Keillor had some good lines! Love the post! Adore the poem! Happy New Year! Cyndy – Glad you stopped by and enjoyed! Happy 2014!